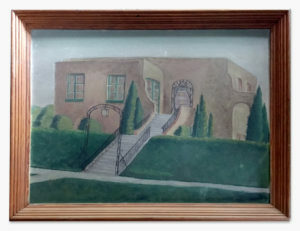 Much of this brief history of our Jewish Community is excerpted from “A History of Temple Judah of Cedar Rapids,” by Eleanor McQuiston, which was commissioned in 1989 to celebrate the 25th anniversary of the our building here on Lindsay Lane. Some of it is also taken from the archives at Temple Judah, and interviews of individuals in the community. Cedar Rapids’ organized Jewish community can date its beginnings in the 1895. This is the year that several families, who had emigrated from Poland and Russia, officially established the Eben Israel Cemetery Association, so that they could bury their loved ones according to Jewish law. Next, they hired a shochet, a Jewish butcher, so that they would have access kosher meats. Then, in 1906, they founded Beth Jacob synagogue. An orthodox congregation. Beth Jacob conducted regular Friday evening and Saturday morning services, enhanced by a children’s choir. Classes in Hebrew were conducted daily and the religious school met weekly. Temple Judah’s official history, however, begins in 1922, when some of the younger members of this strictly Orthodox synagogue became interested in establishing a more liberal service. At Beth Jacob all prayers and services were conducted in Hebrew and the “reform” group felt that it would be desirable to adopt English into the services. They formed a liberal Jewish congregation and elected Charles Schoen as their first president. Since they had no place of worship, they called themselves the Congregation of Judah. The name was in honor of Philip Leibsohn’s father, Judah Leibsohn. They purchased land for a temple at 1947 Washington Avenue SE, soon after, but it wasn’t until May 2, 1927, that Temple Judah completed and moved into its first building. Up until this date, they met for services at the People’s Church and later at the Knights of Pythias Hall. The early years of Temple Judah were a struggle financially. However, by 1944, they had successfully paid off the mortgage for their home and held a Mortgage Burning Party on October 17, 1944. As the congregation grew, activities increased. In 1947, 25 years after the Temple’s founding, they had grown so much, that they needed to add an auditorium to the existing building. However, they were wont to fall into debt again or owe a mortgage, so they carefully raised the moneys necessary and only then did they construct the new wing. 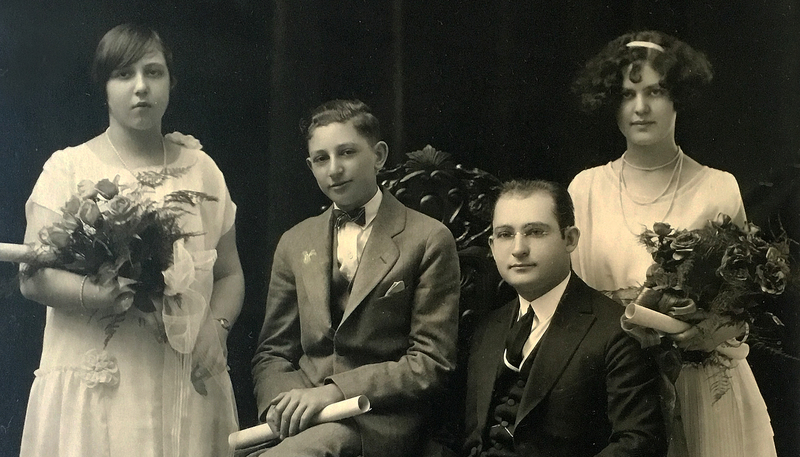 In 1949, there was a desire to present a united Jewish community of Cedar Rapids, so the leaders of the two congregations, Beth Jacob and Temple Judah, began discussions to integrate. Ultimately, it was decided that the two congregations would maintain their individual identities, while, at the same time, share space at Temple Judah’s building on Washington Avenue. There would be Reform and Conservative services offered on alternating Shabbatot, a combined religious school where both congregation’s children would be taught together, and a Traditional Cantor would be hired to lead services for the Orthodox members at the High Holy Days. The unification of the places of worship was a trying and difficult time for members of both congregations. It was necessary to put away hard feelings and attempt to become a unified community. Beliefs were tested, as were family ties and friendships. Despite the difficulties, though, this unified community prospered. In 1956, Mrs. Abbot Lipsky reported to the Board on the shortage of sufficient classrooms for Children’s Sunday School. She noted that when the auditorium had been built, there were 40 youngsters attending classes, but in six years that number had risen to 72. She predicted that in 1957 the number would reach 85. Her report prompted some discussion about the possibility of purchasing one of the adjoining homes. But this turned out to be unfeasible. Nevertheless, the congregations persisted in their interest to build a new Temple. In 1960, Mr. David Albert from Sioux City addressed the Board. He had been chairman of the Building committee of Mt. Sinai Temple in Sioux City when that community constructed their new temple in 1955. He had volunteered to visit Cedar Rapids at his own expense, to share his experience in the problems encountered in his Temple’s construction period and also to share the benefits accrued following the dedication. Mr. Albert stated that there was a definite increase in enthusiasm by his congregation and a conscious effort to perpetuate Judaism. There was an increase in membership following construction of the new building. Attendance at Friday night services had doubled. The young people had increased their activities and were showing a pride in their new Temple. He felt that his congregation was more united and that his Temple’s status in the community had been enhanced. 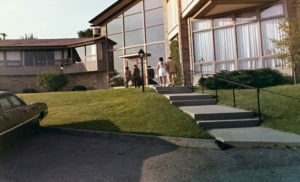 In 1962, Maurice Estes, the current president of the Temple, invited all members to a special meeting to discuss the possibility of moving to a new site and building a new home. In August of 1963 Robert Ettinger, the secretary of the congregation at the time, included the following statement in the Board’s minutes. At the same meeting it was reported that there was $235,000 plus in signed pledges for the Building Fund. Two local physicians, members of Temple Judah, Maurice Estes and Jerald Greenblatt, were determined to see a new Temple constructed and had secured over $230,000 in pledges from the community. Formal ground-breaking ceremonies for the new building were held on Sunday, November 2, 1963. Those included in the festivities were Rabbi Isaac Newman, President of the Board William Gasway; Chairman of the Building Committee, Stanley Seidler; and Chairman of the Finance Committee, Norman Lipsky. The Transfer of the Torahs and the Laying of the Cornerstone took place on August 30, 1964. Two convertibles were used to carry the Torahs from Washington Avenue to Lindsay Lane. Seated in the first car were Rabbi Neuman, A.L. Smulekoff, Dr. Charles Schwartz, and William Gasway. In the second car were Nate Cohn, Sam Becker, Dr. Maurice Estes, and Joe Sinaiko. Dr. David Thaler and Joe Berg were alternates. The following individuals received the Torahs at the top of the hill and carried them to the lower sanctuary: Leo Smulekoff, Harold Becker, Stanley Ginsberg, Jim Handler, and Henry Katz. Those participating in the actual cornerstone ceremony were William Gasway, Don Brown, Stanley Seidler, Norman Lipsky, the architects and the contractor. 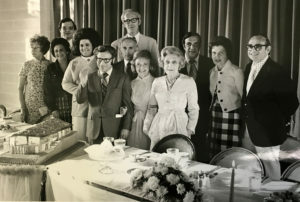 In 1973, Temple Judah celebrated its Golden Anniversary. 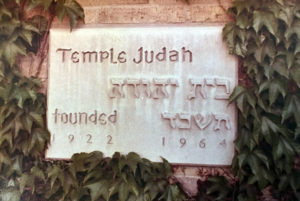 Events commemorating the 50th Anniversary of Temple Judah began on May 4, 1973. Dr. Yehuda Bauer gave a presentation entitled, “The State of Jewry in the World Today.” The celebration concluded with a Golden Anniversary Dinner and program held on Sunday evening, May 20th. Back in 1922, when Congregation Judah was being formed by those wishing to establish a liberal Jewish worship service, The Sisterhood was organized too. There is speculation that if this had not happened, Temple Judah would not have become a reality. The Sisterhood was instrumental in raising funds for many of the functions and activities that happened at Temple. It’s fundraising efforts were directed principally toward the establishment and maintenance of the Religious School. From the beginning, this was Sisterhood’s chief concern. Along the way, however, the women of Sisterhood were frequently called upon for help in paying off the mortgage, redecorating the Rabbi’s residence, landscaping the Temple grounds, installing air conditioning, etc. To raise these needed funds, The Sisterhood planned and held many public events, such as card parties, bazaars, rummage sales, bake sales, and cake raffles. During the early years, Mrs. Charles Schoen donated a fur coat to the Sisterhood to be used in a raffle. It raised $250.00, a mighty sum in the 20’s. It was also the Sisterhood that introduced Jewish cuisine to the non-Jewish members of the Cedar Rapids community. Sometime in 1951, Mrs. And Mrs. Harry Sutton and A.L. Smulekoff attended a fundraising dinner at St. Marks Lutheran Church. The consensus of opinion was, “If they can do it, why can’t we?” So Ruth Sutton took the idea to the next Sisterhood meeting and the tradition began. Chairing that first Temple Dinner Committee were Shirley Bass and Dorrie Frankel. The entire membership of Sisterhood, approximately 50 women, purchased, cooked, and served the food, and sold the tickets which brought over 500 people to that first dinner. In a very short time, the number of people served at this annual event rose to over 1,000. Typical menus over the years have included Chopped Liver, Herring in Cream Sauce, Cheese Blintzes, Brisket of Beef, Cabbage Rolls, Potato Pancakes, pickled beets, and Strudel. A couple of times during the past 30 years there were thoughts of discontinuing the event. It became a huge commitment and demanded hours of volunteer time. Many of the members of Sisterhood had careers and other volunteer interests. The dinners were finally discontinued in 1989. The Sisterhood gained recognition for several of their projects, as well, one being their work with aid to the blind. In a Gazette article, dated October 24, 1971, it noted that for the past 19 years Temple Judah Sisterhood had been involved in helping the blind achieve vocational and personal independence through their three phase volunteer program. The three phases were audio taping, large-print type, and Braille transcribing. The Sisterhood had used their own funds to purchase the needed materials and provided this service to various organizations working with the blind. Discrimination against Jews did not disappear when they set foot in this country. While many say they didn’t feel discrimination as youngsters, they began to feel it as they grew older. It was particularly distressing to Jewish businessmen and professionals to have succeeded in a community on the same terms as everyone else, only to be rejected by some civic groups and social clubs. Only in the late 1960’s did some private clubs in Cedar Rapids abandon policies prohibiting Jews as members. Since the founding of the Jewish Community in Cedar Rapids, Jews have been an integral and effective influence on the larger community. They have founded organizations, served on civic committees and boards, been active participants in educational and health care issues, volunteered time and talents and made significant financial contributions to hundreds of causes. Many of these activities, and acts of generosity, were done without expecting recognition. Unless the participation became public, due to the nature of the service or contribution, no records are available, and the deed is known only in the heart of the doer.